Pet Allergies and Eczema: Is it Time to Switch to a Pet-Free Home? Do you adore animals, but you’re terribly allergic to them? If dogs, cats, or any other animals cause you or your children major allergies, it might be time to consider giving the pet to a new home. Why put yourself or your children through the torture of allergies, eczema, or asthma, if it can be avoided? But the idea isn’t ever an easy one. After all, our pets are really part of our family, how can we imagine saying goodbye? 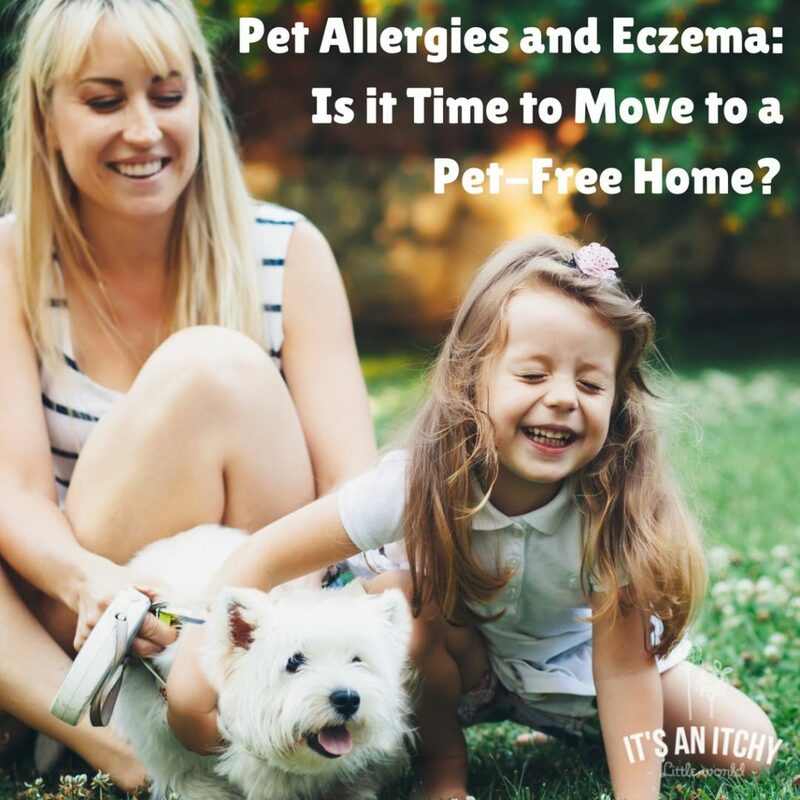 In our post this week, we take a deeper look at pet allergies and eczema, as well as the tough decision to possibly switch to a pet-free home. Before answering that tough question, let’s first consider whether eczema can truly be caused by pets. As mentioned in What Triggers Eczema? With Dr. Peter Lio, a major contributor of eczema symptoms are allergens – including pet allergens. When focusing on health conditions like eczema, allergies, and asthma, one of the most common allergens is pet dander. Dander is actually the animal version of dandruff! Dander is usually the cause of most animal allergies because it is so easily spreadable. It can attach itself easily to clothing or be inhaled. Dander can appear in almost all animals, but that does not mean that dander among all species is equal. For example the dander levels between a heavily furred dog and a rabbit are very different. But what if it’s not dander? You may also be allergic to a pet’s saliva and if you are unable to train your pet not to lick you and give you kisses, then saliva is a hard allergen to avoid. In our previous blog post: Pet Alternatives for People with Animal Allergies, we look at some other allergens that might be triggering your eczema. Whatever the cause – once you learn which animal allergen is triggering your eczema, you’ll be able to work toward a more effective plan of managing your reactions. What if I’m Not Ready to Give Away my Pet? Giving away an animal is never easy and believe us – it’s something we do not encourage unless it is absolutely necessary. In fact – we encourage you to explore ALL other options before giving away your pet! Below, you’ll find a few suggestions on treatments and practices that can help you live a better (and less itchy) life with your furry pal. Do you have mild or moderate allergies to your pet? If so, most commonly you’ll experience watery eyes and a runny nose. If you happen to feel constant congestion, then working some nasal irrigation into your daily routine can drastically help you control those symptoms. One of the most popular systems for nasal irrigation happens to be a Neti Pot. Many people who suffer from allergic rhinitis swear by this device because it is quite effective at removing mucus or dirt that may fall into the nasal cavity, like dander. If you happen to suffer from eczema caused by dogs or cats, then you might want to look into what homeopathic remedies can help you. Homeopathy is a great natural solution for eczema and allergy symptoms. Although, it’s always best to seek medical advice and visit with a homeopath, there are a few types you can try specifically for pet allergies such as Allium Cepa. Although we would never recommend over the counter antihistamines, as they are not a safe long-term solution, there are some natural antihistamines that can be used to suppress pet allergies. Surprisingly, the herb, stinging nettle is a fantastic antihistamine and can be used for eczema, hay fever and inflammation. We recommend opting for freeze-dried stinging nettle pills like this one, as the freeze-dried versions seem to react better to allergens. There are also several natural topical remedies that can help one’s eczema from pet allergies. Because eczema affects the skin barrier, you want to make sure to keep the area well moisturized in order to avoid inflammation and infection. However, because there are many types of eczema, you want to make sure to opt for a moisturizer that is made just for the type of skin symptoms you are experiencing. Itchy Eczema – The most common form of eczema for allergens is usually itchy, dry eczema. This type of eczema appears as red, itchy and sometimes flaky patches. Essentially the skin barrier is lacking moisture. For a deep moisturizing treatment, make sure to try Emily Skin Soothers for Itchy Eczema which uses both olive oil and beeswax to soothe dry, itchy skin. Red Weeping Eczema – If your skin is inflamed, red or weeping, then moisturizing skin can be a little difficult. Not only can the affected area be painful, but it is most likely extremely sensitive. If you’re suffering from weeping, red eczema, then make sure to check out EczeHerbal #1 – Oozing Eczema Treatment. This treatment uses specific Chinese Herbs to calm weeping skin and prevent further infection. Another really good one is Emily’s Hot Skin Soother. Scaly Eczema – Lastly, scaly, dry eczema also requires sufficient moisturizing to eliminate further infection. This type of eczema usually appears as “crocodile skin” and can easily be calmed with a variety of deep moisturizing treatments like this Organic Manuka Honey Skin Soothing Cream. This cream is full of nourishing ingredients such as beeswax, Manuka honey and Manuka oil to keep skin well moisturized. If you’re dead set on not giving up your pet, then you may want to look into whether your pet’s bedding or food might actually be causing your eczema to flare. Cleaning your furry pal’s bedding or usual hangouts can actually reduce the spread of dander and can perhaps decrease your chances of eczema flareups. Have the dog bathed regularly. Keep the pets out of the bedrooms and always off beds and sofas. Use an air purification unit specifically made to filter out pollens, dander, and dust. Lastly – if you haven’t checked out your pet’s food – you might want to do so as soon as possible. For people that suffer from a shellfish allergy, some pet foods can wreak absolute havoc on your system, even if you’re not the one consuming it. Gluten and soy are major fillers used in dog food as well. Make sure to check the label and ditch the food if you think it might be the main culprit of your eczema. If you’re not able to find relief after conducting all of the above – then maybe it’s time to really consider making a pet-free home. As we already mentioned, it’s NEVER easy giving up a pet and we never recommend it unless it’s absolutely necessary. However, is it really fair to make yourself or others suffer? Think about your pet too! Shouldn’t they deserve to be cared by someone who can give them 100%? Honestly – it stinks and it’s never an easy decision, but it’s important to consider the bigger picture. Alternatively, if your family is looking to bring home a pet, then it’s always best to do some allergy-free research beforehand! If dogs seem to trigger a reaction, try another animal, not all animal allergies are the same. It’s also great to research some alternatives to pets that do not have dander such as reptiles, fish, and some types of birds. Whichever option you choose, remember that your health or your family’s health is just as important! Do you suffer from pet allergies and eczema? Let us know how you handle it in the comments below!